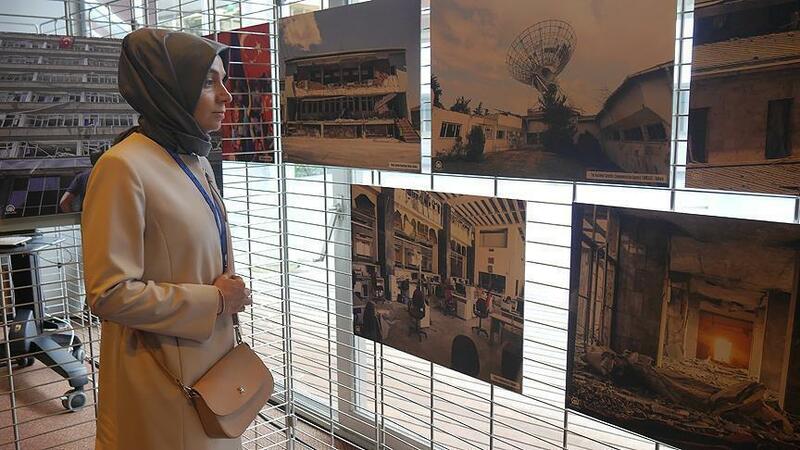 An exhibition of Anadolu Agency photos and footage taken during Turkey’s defeated July 15 coup plot went on display in the Council of Europe, Strasbourg on Monday. On Wednesday, Foreign Minister Mevlut Cavusoglu will attend the official opening of the week-long exhibition which shows chronological images revealing what happened on the night of July 15 and after. The July 15 coup attempt resulted in the deaths of over 240 people and injured more than 2,100, leading to a nationwide probe to eliminate Fetullah Terrorist Organization (FETO) sleeper cells which had infiltrated state institutions, including the judiciary and army. Fetullah Gulen, who the Turkish government says heads FETO, has been living in Pennsylvania since 1999. Parliamentary Assembly of the Council of Europe (PACE) members -- including lawmakers from 47 member countries plus representatives of international organizations -- are expected to visit the Strasbourg exhibition. PACE’s Turkish delegation chair and Justice and Development (AK) Party lawmaker Talip Kucukcan told Anadolu Agency the display tried to show what happened on July 15 and reveal the threat Turkish democracy faced. Kucukcan said the exhibition would show that “democracy’s main guards are the Turkish people”. He also thanked the Turkish parliament and Anadolu Agency for their support.